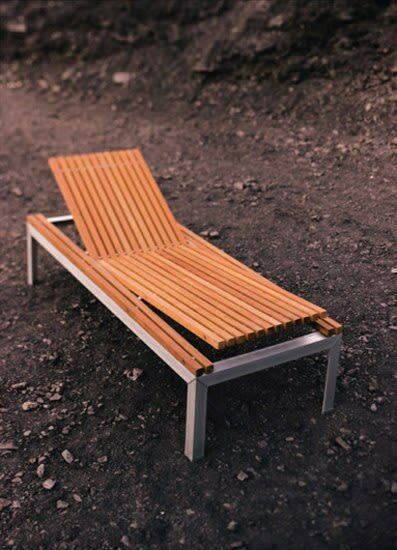 A solution for every need ExTempore is a full range of modular outdoor furniture. An architectural collection offering intelligent solutions for all day-to-day functionalities like dining, sitting, resting, reading. Made of the best quality materials for use in- or outdoors without concerns.Top of the list materials The removable frames are made of aluminium with corners and feet in synthetic material (also specially developed). All joints are made of stainless steel of the finest quality.The Jatoba wood Extremis uses originates from regions controlled by nature conservation organisations. This Brazilian hardwood allows Extremis to manufacture office furniture in extraordinary sizes (for example a table 270 cm long), so your wishes for new office furniture can always be fulfilled. The combination of materials was dictated by aesthetic, ecological and durability considerations. The same hardwood is also used for the chairs, low chairs and footrests, which are furthermore all stackable. The benches can be completed with a back and arm rests. The deck chair has two functions. On the one hand, its back can be set in different positions, thus guaranteeing optimal use as a deck chair adapted to your personal taste. On the other hand, when put in its lowest position, it can be used as a low table. The tables are available in different sizes and can be made bigger by using extra leaves. All tables can be equipped with lockable wheels to guarantee effortless mobility. In addition to the high tables, the range also includes low tables that can perfectly be combined with the low chairs and the footrests. And the chaise longue of the Ex Tempore range catches the eye with its elegant lines. Multifunctionality The combination of materials was dictated by aesthetic, ecologic and durability considerations. Because of the endless possibilities, ExTempore is often used in projects of all kinds. The same hardwood is also used for the chairs, low chairs and footrests, which are furthermore all stackable. The benches can be completed with a back and arm rests. The deck chair has two functions. On the one hand, its back can be set in different positions, thus guaranteeing optimal use as a deck chair adapted to your personal taste. On the other hand, when put in its lowest position, it can be used as a low table. No rusting or tearing Problems like rusting of iron garden furniture, tearing of plastic garden furniture or the need of a protective paint layer on oak garden furniture, will never happen with the high quality materials of ExTempore furniture for the garden. A very social barbecue set The range would not be complete without a barbecue. The ExTempore barbecue is equiped with adjustable grills and a small wok to keep the food warm. The brackets can be used as handgrips or for hanging the accessories onto. The barbecue can be closed with a lid and is made of stainless steel. Its frame as the frames of the other products of the Ex Tempore range is made of anodised aluminium, its joints of stainless steel and the tabletop of FSC labelled Jatoba wood. ExTempore extra high tables and benches Extra high tables and benches have been specifically created for hotel, restaurant, and bar applications and, contrary to the usual tables and benches, come with foot rests. This way you can either stand at, lean against, or simply sit comfortably at the tables. ExTempore Patchwork ExTempore Patchwork is the extra long version of the timeless ExTempore table. The hardwood strips are cut to different lengths creating a beautiful tabletop pattern and allowing table lengths from 300 to 450 cm. Its longest version can accommodate up to 14 people. So it is simply ideal to gather a large group of people for a pleasant meal. Extremis – almost twenty years of tools for togetherness It was purely and simply out of love that at the end of the eighties Dirk Wynants, an interior designer and son of a furniture maker, moved from his native region north of Antwerp to the other side of the country.